The Capita Defenders Of Awesome is hybrid camber with camber between the feet, flat after and then a little rocker. This is an affordable but somewhat technical all mountain freestyle ride for those that like air most of all. If you got it as your primary board just make sure you know it’s strengths and limitations. The overall flex of the 2018 and 2019 Capita DOA feels like it’s easier to butter but it’s not any less poppy and overall flex has seemed to improve the last few seasons. The 2018 and 2019 Capita Capita Defenders Of Awesome are the same rides so the 2018 review still stands. 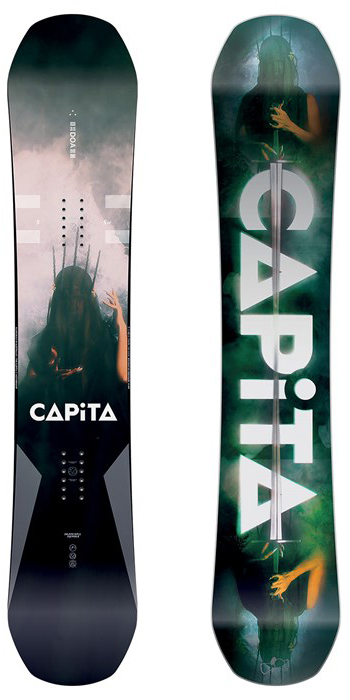 The Capita Defenders Of Awesome has a couple of things going for it that make it a great board for its price range. It’s aggressive for a twin, it’s super poppy and it has a camber like feel to it. However, don’t let the low price lead you into believing this is a beginner/intermediate board. This is still aggressive all mountain freestyle twin that’s only a little less forgiving than a camber ride. We think the DOA is a pretty good board and especially so for those that like air. If you want a more forgiving well-rounded ride that does everything that is mountain freestyle well but nothing exceptional the Outerspace Living is the better call. If you want a more technical mostly camber ride we prefer the way the Outsiders turns over the DOA’s camber to flat profile and to a lesser extent feel it pops better too. Still, this is a good board and I can see why so many park riders are into it. Days: 3+ on the 2018, 4+ on the 2016 and 1 on the 2013. Conditions: End of the year Sierra snow that’s hard in the morning, medium and then soft to slushy as the day goes by. Set Up: Centered always 23″ wide always 15 front and -15 back always. Flex: Medium and lively from the middle to the end of the tip/tail. It’s a little work to butter for a board this type. You could get a nice snap off the tip/tail. The 2018 Capita Defenders Of Awesome feels like it’s a little easier to butter than past years models and the overall flex of the board has improved a good bit. Capita has been improving the flex year over year and I’m starting to notice a difference in the DOA’s overall ride. It’s softer but it’s more than just that. It feels like it can flex further than before but still keep that snappy lively personality Capita is known for. On Snow Feel: This has a solid stable feel for those that like a stable feel underfoot and it picks up speed pretty well for its flex regular or switch on the groomers and also has a great ability to pop off rollers. It’s not super aggressive or technical in comparison to camber but it feels like it’s almost there with mostly camber boards like the Outsiders. That’s weird because there is more early rise with the DOA but they feel pretty close. The flat after the camber is close to the snow and there is still an edge waiting to be caught if you don’t stay on your game. The boards’ personality type calls for semi-aggressive to aggressive riders on a budget. It’s all about stability at pretty good speed, power butter, and mostly air. Powder: This is better than a camber board but just by a little. Most riders who will like this board don’t mind the kind of stay on your game ride in powder that this has. So compared to camber this is better but there will still be some work of your rear leg to stay afloat If you are a rider that needs an easy float then look to another board when it gets deep. Turn Initiation: The DOA is pretty quick edge to edge and starts turning quickly. Turning Experience: The first few times I rode this I liked it for turning and carving but the more I compared it to other hybrid camber boards the more I found it to have some detractions. When it comes to medium to wider radius turns it’s pretty not bad. Carving is pretty good but when comparing it to the Mercury on the same day it just didn’t have the same magic in and out of a carve. Also comparing the DOA to the new Outerspace Living it just didn’t complete the turn in a fun way. Carving: While the flat after the camber pops really well for an ollie it seems like it’s messing up the radius of the carve. It’s just not as dynamic as Capita hybrid camber boards without flat after the camber and like regular turning, it’s just not as fun. Skidded Turns: It’s not great for beginners and intermediates that rely on skidding their turns and don’t let the low price tag fool you into thinking it’s a beginner board. Speed: The base isn’t super fast but there is little chatter for a board of this type. The Capita Defenders of awesome feels stable and pretty damp for a twin. Uneven Terrain: So the stiffer flex and faster ride are great for better conditions but this comes at a disadvantage when it comes to powering through a bumpy end of the day groomer. You can feel a little more rough stuff under your foot than you can with other boards with better dampening tech. It’s a board you want to pair up with bindings that have lots of shock absorption like the Contact Pros. Even then you can still feel things you wouldn’t with those bindings on more damp boards. Still, it’s better than most with this board. Now the 2019 and 2018 Capita DOA is much better than in the past and feels like it can handle more uneven snow of all kinds. Approximate Weight- Pretty light for its price but I’d say it’s more on the normal side. Edge Hold: the edge hold is more of a good snowboard that doesn’t hold that well in harder snow. We’d love to see the bump in the center that the BSOD and Totally FK’n Awesome has. Our only gripe is we wish Capita would have spent a little more money and put in the same sidecut as the Mercury and Totally FK’n Awesome that has a little bump dead center in the waist. It would have made this board much better in conditions that aren’t as good. Switch: This is a true twin and it’s going to be the same either way. The only board I personally like riding switch better is an asymmetrical shape. Rails- Not the best rail board but it can be done if you are a strong confident rider. For me, I’d much rather be on the Horrorscope or even better the Ultrafear. Pipe: If the edge hold was a little better and there was a little less flat after the camber the DOA would be an excellent board for those that know how to ride the pipe well. Jumps: What a fun board to Ollie and jump. The combo of flat and camber is great for generating your own air. If you are into bigger jumps this is a fun board and the tip/tail won’t give way that easy if you land a little off of center. Probably one of the strongest points about this board. It seems to be designed primarily for those that live to be in the air. So, all in all, turning the board is a little dead with the flat after the camber but it sure does pop well on an ollie. It’s hard to find a good aggressive board like this at this price range and while we prefer the Outsiders and Outerspace living a little more this might work for you more than it did for us. Other than a few minor tweaks not much has changed for the 2017 model so most of the 2016 review stands. It has been updated to reflect how it stands with the 2017 line. We try to get as many images of the Capita Defenders Of Awesome, but forgive us if they're not all there. The best board I've tried for all terrains. Very handy to play and stable at high speed. I bought this board with great expectations. In fact it is a stable and fast board. However, performs really poor in powder. Also, the edge hold is not that great, especially in icy conditions. It is not a bad board overall, but not a great one either. Note: I have the 2016 version of this board. By far this board has progressed my skills the most out of any board that I've owned. But a large part is because this board doesn't really allow you to be lazy with your technique as much as others. When I first tried this, I was coming from a reverse camber Rome Agent and I loved the camber feel of the carves on the DOA. The pop was amazing and it felt decently fast. The more I tried out boards that are similar to this, the more this board felt more sluggish. On hard packed days, this board definitely does not inspire confidence. Comparing this with a Jones Mountain Twin, the edge hold felt very dicey and the base felt noticeably slower. 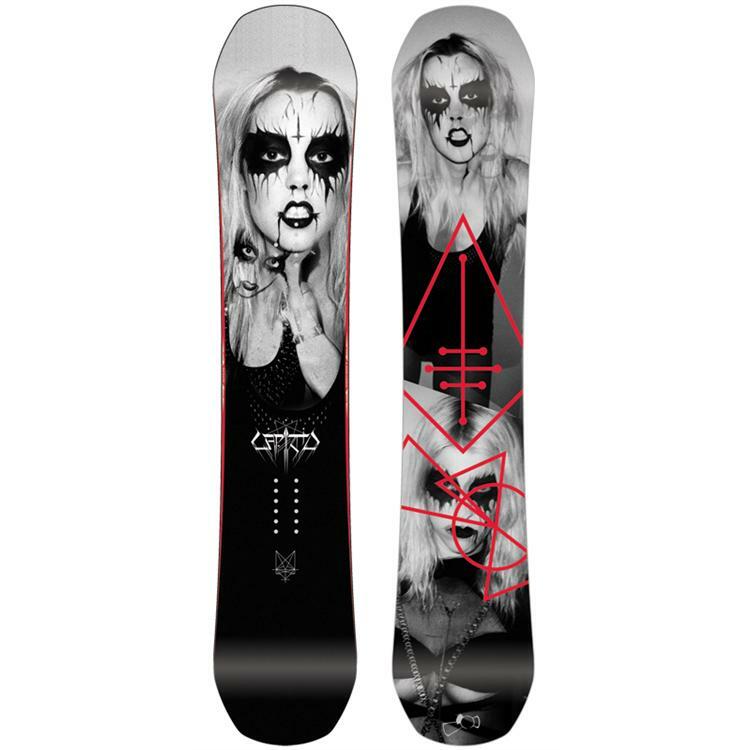 Just be cautious when buying this board, it will make you a better all mountain rider but it won't be as easy as some of the other boards out there. If park is more your thing, this thing fits in pretty well. It can handle almost any jump and it's okay for most rails. DON'T BUY! Hey guys I was so stoked on this board and it rode great for the first 5 to 6 times then I had some major issues. With my first Board, about the 5th time riding it the thing came delaminated! Then back country hooked it up their warranty program so shout out to them. However with the new boar, 3rd time out again the side wall blew out in 2 spots on my toe side edge! I contacted capita and they refused to help and were quite rude as well. Its a great board when it works but I don't feel that it is a quality product and wouldn't waste your money on it. For boards with hybrid tech, there's a lot of options out there, and this stick doesn't compete. While it is stable and reasonably fast, that's about all I can say. It doesn't carve particularly well, and I find that the flat kick tech doesn't really give any noteworthy advantages while making it eager to snag an edge and pitch you if you get lazy. It doesn't float in powder, has average edge hold, and its flex broke down quickly after about seven sessions of hard riding (note that I'm a heavier rider). I'm lucky enough to have a big quiver and I find myself reaching for this board less and less. Is it okay? Sure. But that's all it is. I'm going to be the odd one here and just say that this thing is a bit overrated. Coming from Rockers and going to this camber, one may be impressed by the poppy snap / rebound of this board's camber. However, if you've spent any time on quality cambered boards (I have) - this thing is mediocre at best. Sure, the graphics are really cool and the board is lighter than most, but that's where it ended for me. 1. Float in Powder - this board was just horrible. Even in a few new CM of pow, it's like the board went into "digger mode," and sunk under the snow. I'm not sure what to attribute this to - perhaps it's the really long effective edge - that Capita has pushed out to the tip/tail, making it hard to float? Looking at the specs - the effective edge is significantly longer than most (for board size). 2. Dampening - the core of this board does absolutely nothing to suppress any vibrations from ice / imperfect conditions. Ice/crud simply resonates through the board, into your legs, up your knees, you get the idea. As a sidebar - this was not my board. I borrowed it from a buddy, and rode it for a 3 day weekend (out of town). I was very disappointed that I didn't bring a backup. This board made me progress like no other. Having bought into the rocker craze before it was refreshing to feel camber between my feet. The control and bounce back you get from the turns is exhilarating. My jumping ability grew exponentially too as it seems to pop off and land so effortlessly and always in control (no unpredictable fidgety rocker to bugger your jump up!). I'd recommend this to anybody who wants to progress. Only downside I see is it takes some hard work to butter/press but you can still do it. I love this on big jumps, raills, haulin on groomers, tuns of float. But this board has compleatly changed how i land and ride away from everything. Any one who has some awesome that needs to be defended this is the board.